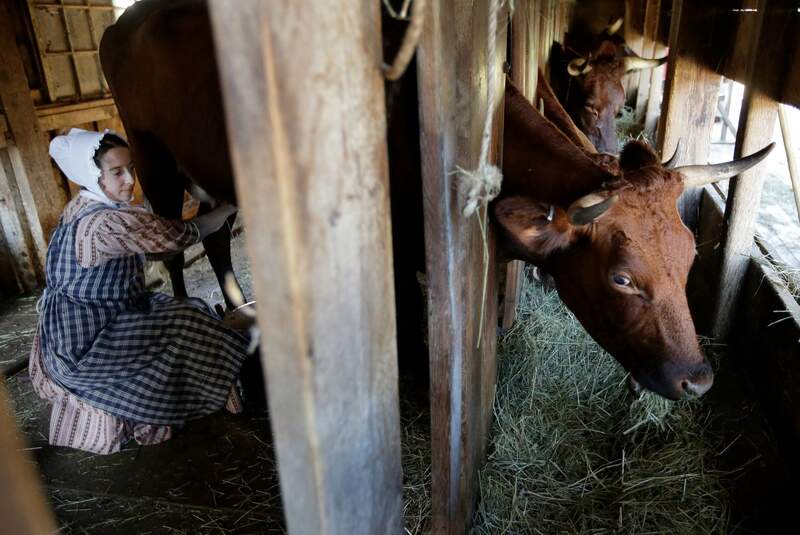 Ellen Watterson re-enacts an 1830s farm worker milking a cow named May in a barn at Old Sturbridge Village, in Sturbridge, Mass. With a $75,000 grant from the National Endowment for the Humanities, Old Sturbridge Village, a living history museum that depicts life in a small New England town in the 1830s, is taking a deep look at the way it presents the past, including the roles of minorities and women, in an effort to stay relevant to a 21st century audience. 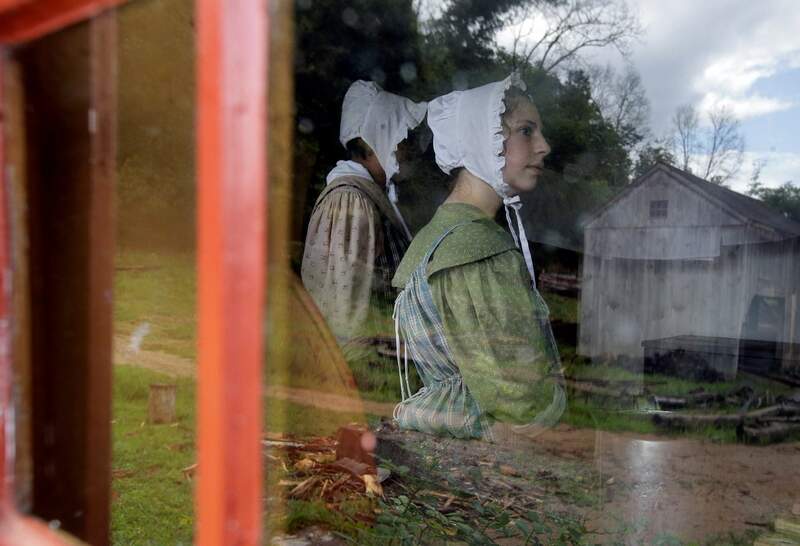 Loralei Arndt, right, sits behind a farm house window as she re-enacts an 1830s farm worker at Old Sturbridge Village, in Sturbridge, Mass. 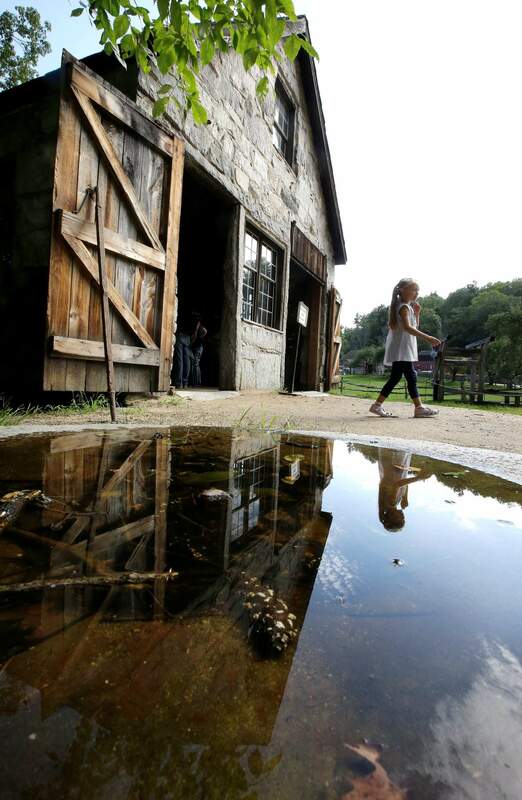 A child walks away from an entrance to a blacksmith shop at Old Sturbridge Village, in Sturbridge, Mass. 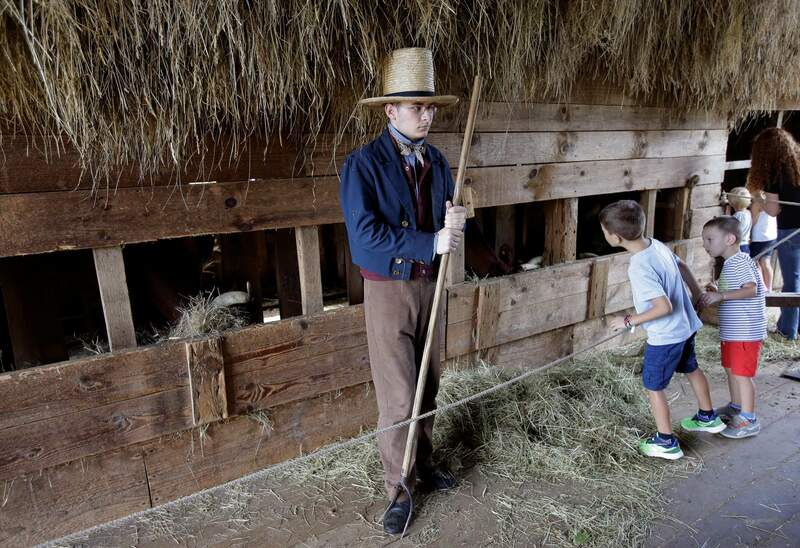 Jadon Rivard, center, re-enacts an 1830s farm worker as children explore a barn at Old Sturbridge Village, in Sturbridge, Mass. 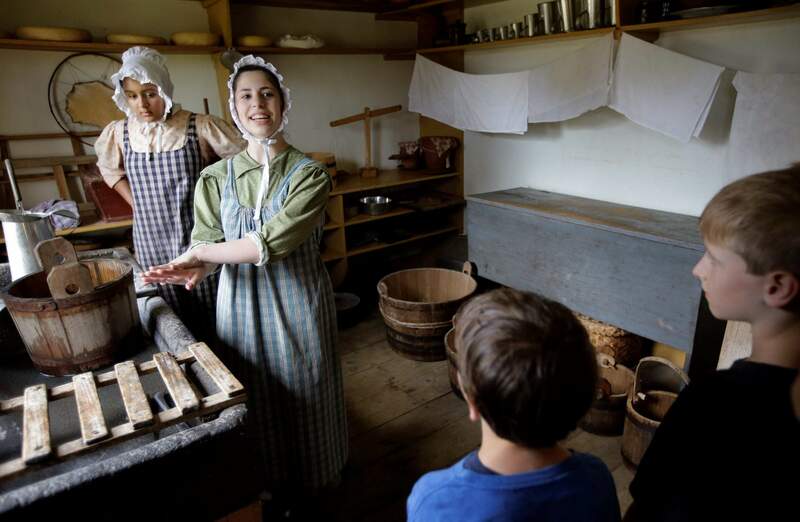 Hannah Ingersoll, left, and Loralei Arndt, second from left, re-enact 1830s farm workers as children watch in a cheese room at Old Sturbridge Village. 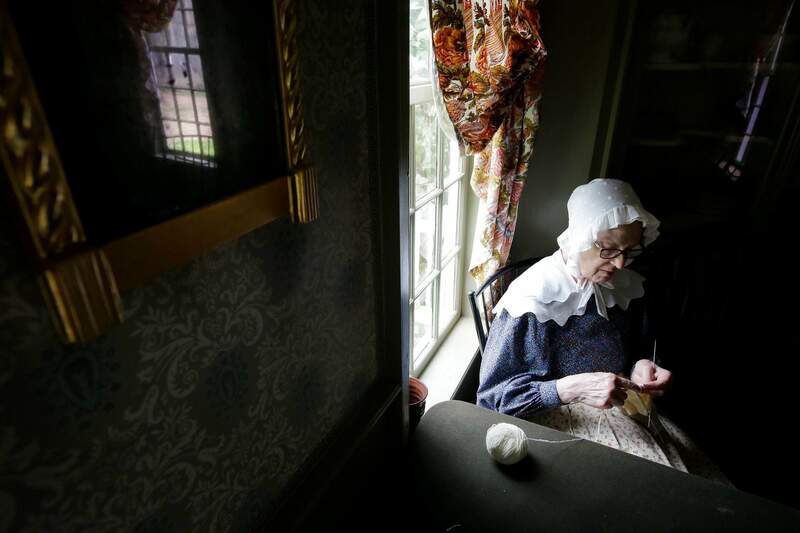 Re-enactor Claire Gregoire knits a mitten using hand-spun yarn at Old Sturbridge Village, in Sturbridge, Mass. BOSTON – A Massachusetts living history museum that depicts life in the early 19th century is looking to overhaul the way it presents the past in an effort to stay relevant to a 21st-century audience. Old Sturbridge Village has received a $75,000 grant from the National Endowment for the Humanities it will use to partner with scholars and other consultants for a multi-year study into how it portrays four areas: agriculture and food, civics, industry and economy and race and gender. Re-enactors in the roles of 1830s farm workers carry milk buckets and pitchers in a barn at Old Sturbridge Village, in Sturbridge, Mass. 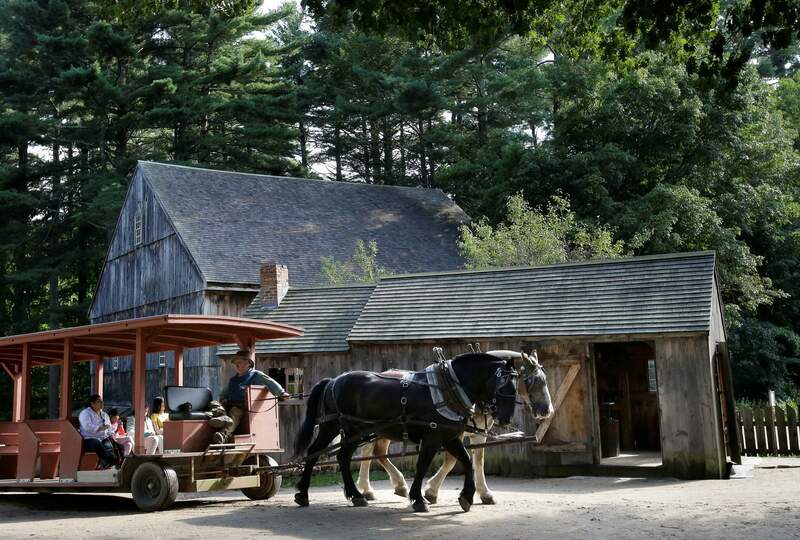 A horse-drawn wagon makes its way past a building at Old Sturbridge Village, in Sturbridge, Mass. Old Sturbridge Village, on 200 acres in central Massachusetts, depicts life in a small New England town of the 1830s, with 40 to 50 employees dressed in period clothing going about daily routines in the home, workshops or farm and interacting with visitors. It gets about 250,000 visitors a year. 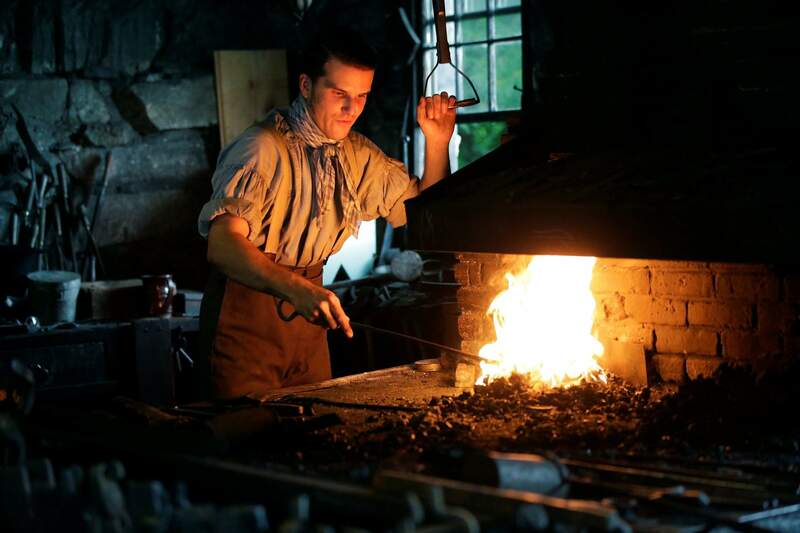 Derek Heidemann re-enacts an 1830s blacksmith at Old Sturbridge Village, in Sturbridge, Mass.